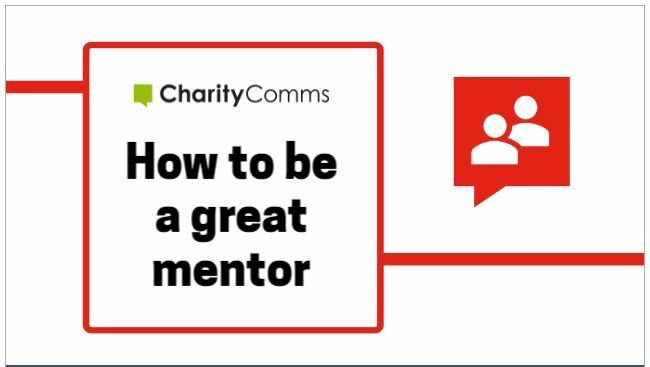 Thank you for your interest in becoming a CharityComms mentor! We are currently looking for mentors across all comms disciplines at all levels to help our mentees who have applied to the Peer Support Scheme. The mentoring scheme is a personal matching service. Applicants fill out an online form with information on their job role, career experience and what they’re looking to get out of the scheme so CharityComms can make an appropriate match. Once we’ve made a mentoring match, an intro email is sent to mentor and mentee, so you can arrange your first meeting. This is a chance to get to know each other, talk about the mentee’s objectives, let the mentee know how you feel you might be able to help as a mentor and assess if it feels like a good match. We provide you with a check-list of what to go through on your first meeting, which includes planning how often you’ll meet and roughly over what time period (on average people tend to meet every four-six weeks for an hour or so over a time period of six-twelve months). We suggest reviewing how things are going after a few sessions. CharityComms will also check in with you both from time to time to see how you’re getting on. We have guidelines on how to keep on track with your mentee’s objectives here. The length of time a mentoring relationship continues varies between everyone. It’s good to discuss this with your mentee when you start the mentoring. You can read more about how to approach the end of mentoring someone here. You don’t have to have 20 years of experience to be a mentor for us. People from different sized charities and job levels apply for mentors on our scheme, from comms assistants to associate directors of communications. So we’re looking to recruit a broad range of mentors. Different people will have different issues they’d like to address. Some people will be working on a specific project that they might want the expertise of a mentor to bounce ideas around with, for example refreshing their website or putting together a comms strategy. Others might have just taken on a new role with more responsibility than they are used to and want to have a senior colleague to be able to share the experience with, while others might want inspiration on how to move forward in their career. Who makes a good mentor? We’re always on the look-out for more mentors on our scheme, the first step is to fill out a brief online application form, to give us a bit of background info on you to help us make a good match.